Public-private partnerships begin to bud to solve area transportation challenges with software and sensors. On February 28, 2018 Greater Portland Inc. convened a speed-dating style meet up at Daimler America where public agencies could state the mobility challenge they were trying to meet, and private companies could say how they could help. Public agencies and private companies tend to run at different speeds. The former slow and cautious, the second fast and impatient. for public agencies to worry on problems – like my puppy with a bone – to get to the right problem before they have to issue an RFP. That's a value for them, not wasting time." After a morning of pitching and counter pitch, they had one-on-one consultations. After that the public agencies awarded golden hubcaps (a plastic hubcap sprayed gold) to the firms they wanted to work with. 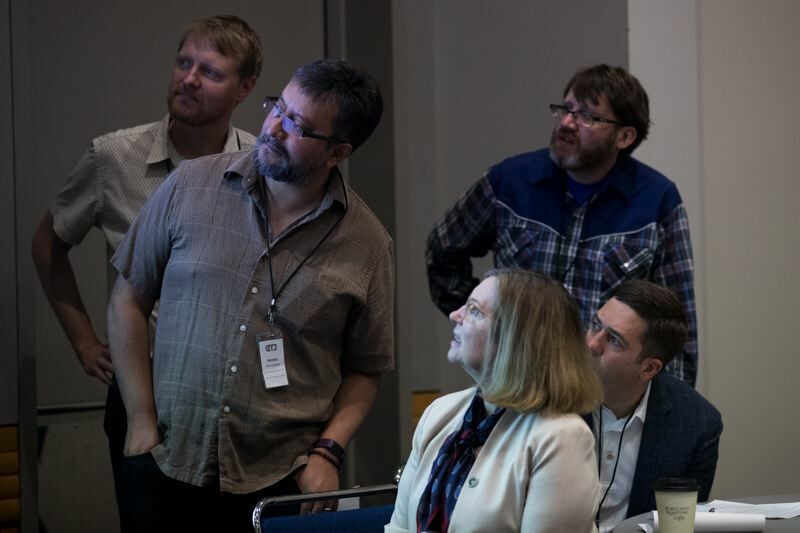 On June 22, those pairings got together in public again at the Global Tech Jam at the Oregon Convention Center to report on their progress. After they had all spoken, one thing remains true: Rome wasn't built in a day. Formal public private partnerships (PPPs) are slow in the making. Usually they go through a request for proposals (RFP) process to avoid favoritism. "We did the introduction but it was up to them to figure out how to best work together," said Purdy. Most groups met weekly or every few weeks in the spring to hash out a method. First up was a group from Lake Oswego City Council, engineering firm AECOM and 10 Branch. They want to turn the Lake Oswego to Portland trolley line into a corridor for autonomous vehicles. They would run on pavement (the tracks would go away) and share the road with pedestrians and cyclists. Lake O city councilor Jackie Manz gave a history of the trolley line — no one in the audience had ridden it — and Miles Haladay, managing partner explained the rationale. Highway 33 is a bottleneck and this would relieve commuter traffic. According to the Lake Oswego Review, Haladay said he was inspired by self-driving electric shuttle buses that have recently begun to operate in Las Vegas and Paris, and showed some tantalizing slides of plan drawings. Companies such as Easy Mile, Navya, Local Motors (Olli) and Toyota are heavily into autonomus busses. Previous discussions about developing the trolley corridor have generally focused either a streetcar or a bike path, and Haladay said he saw the autonomous technology as a possible middle ground. "Instead of just thinking about streetcar or no streetcar, mircotransit creates other options," Haladay told The Lake Oswego Review. "Lake Oswego needs to start thinking about these things showing up." Metro wants transit on that corridor and Lake Oswego wants bike lanes. 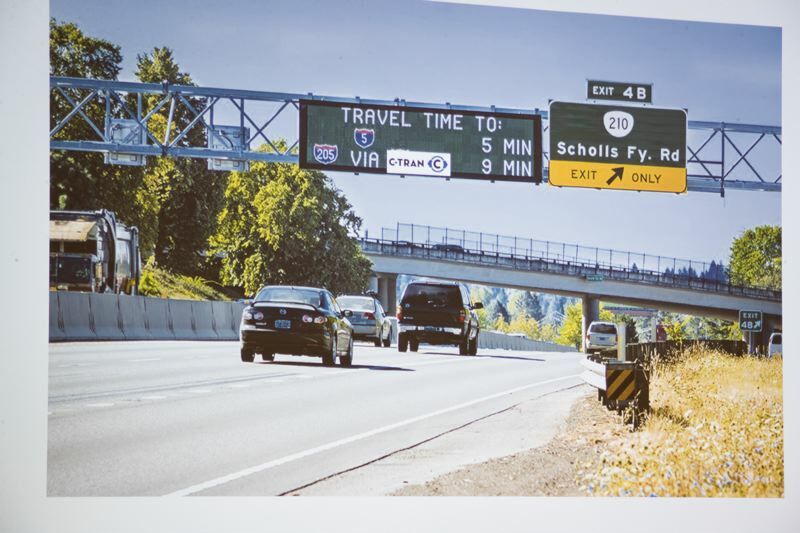 The group hasn't officially approached any of the various public agencies that jointly own the corridor, and Haladay and Manz said they made their presentation at Tech Jam as a way to get the initial word out and seek feedback on the concept. The autonomous buses could potentially run only on weekdays or during peak travel times, Haladay said, leaving the corridor open for bikes during off-peak hours. There are safety concerns because the corridor threads through private yards. Omar Jaff, an engineer from AECOM, said the driverless vehicles can communicate with each other, so they can run in a series as capacity depends. 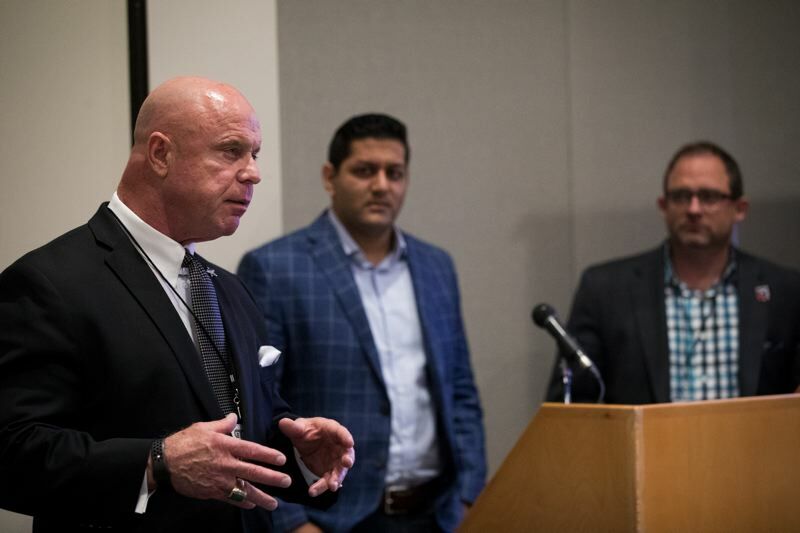 The group's next step would be to officially present the idea to the Lake Oswego City Council, which Haladay said he hopes will happen later this year. The goal would be to secure funding and approval for a professional study to evaluate the feasibility of the concept. Manz and Haladay didn't offer a timeline for when the buses could be up and running, aside from stressing that considerable work would need to be done to find out if the idea is feasible, and all of the corridor's stakeholders would need to be on board. "Even if we said 'go' today, this would still be a five- to 10-year project," Haladay said. The nonprofit Hack Oregon won two golden hubcaps. The first was from the Portland Bureau of Planning and Sustainability, the second with Multnomah County Community Services. Hack Oregon is a power house team of volunteers who specialize in open data: taking data gathered by public sources and making it available to other agencies and the public. Hector Dominguez, open data coordinator for the Bureau of Planning and Sustainability's smart city initiative said they have 200 sensors on poles which can count bikes and cars every two seconds. They worked with General Electric, Intel and AT&T to design and install them. In places like East Portland they could get data on communities that are traditionally underserved. Looking at air quality data could be crucial in discovering pollution. They were looking at access to stats like TriMet ridership numbers, Multnomah County permit issuing history and calls to the City of Portland's Safety hotline. Citizens could use permit data for instance to see the evolution of telecommunications investments. Hack Oregon's goal is to makes such data visible by simply clicking on a URL. "The data lives on the civic platform," said Lee Coates, Executive Producer for Hack Oregon's Transportation Systems Team. For his day job, Coates is a systems analyst for the City of Gresham. Hack Oregon works on projects in transportation, housing, neighborhood development, local elections and disaster resilience. TriMet, for instance, answers questions about buses all the time, not just from the public, but from other agencies. "That takes time and resources. It would be great if they could figure it out for themselves, what the ridership on this bus line is." Hack Oregon had permission to work with TriMet's team of analysts. "Biketown (the orange bike share service) provided unlocked data for the Cascadia R (R is a programming language) conference. They said take a crack at this." His fellow hacker Brian Grant, is a support engineer at Urban Airship, the cloud software company. "What we do that enables this is create micro services," Grant said. "We take data in a csv or a pdf, and convert it into a modern tech stack, that has endpoints built on top of it, APIs. It's open source so anyone can make their own project, slice it and dice it and show of what's important to them." Small cities are gushing data like black gold, but don't know how to refine it. Taylor Eidt, a GIS (Geographic Information System) planner with the City of Hillsboro's planning department, called wrangling city data a "generic question," because every city is dealing with it. "We recognized we needed to walk before we could run. 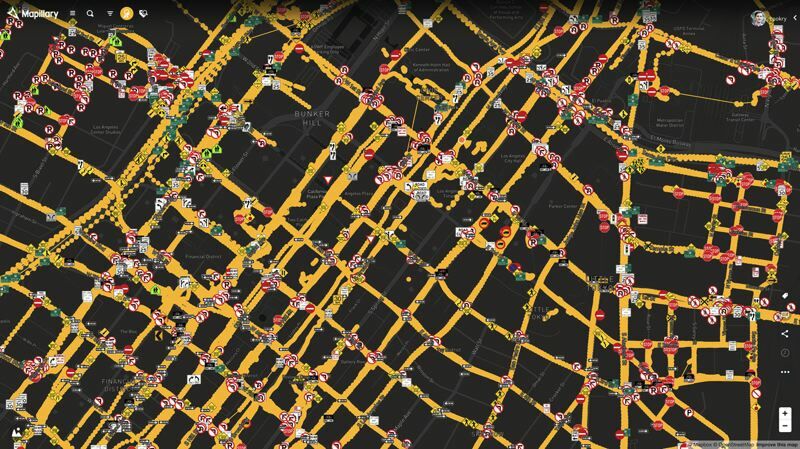 We were trying to grab data from everywhere but we realized we had some gaps to fill in, like our sidewalk data and our bike infrastructure data. Things that makes our city our city." He said their goal was "scalable street level intelligence" with a view to making better policy. He praised Mapillary for helping make comprehensive data sets and keep the data up to date. "We have a workflow where Mapillary community partners drive the city streets (with camera equipped cars) and feed that into the city's database. As a result, the city got a view of where the sidewalks really are - they are always changing with development. They scaled up coverage of Hillsboro and Portland with a larger fleet of vehicles. 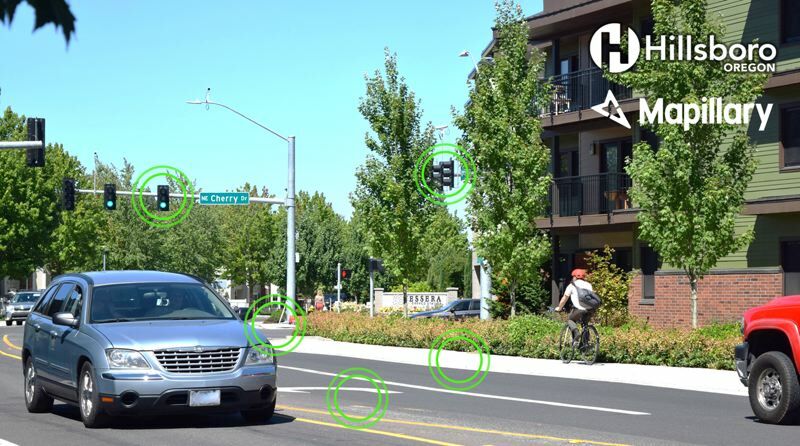 A Mapillary representative said the for privacy they can automatically blur faces and license plates for 99.99 percent accuracy. There are 50,000 traffic signs in Hillsboro already in a database. They took the streaming data from the vehicle as it cruised the streets taking photos and matched it to that database. They also could detect a street sign when it was partially occluded by overgrown bushes and trees. This would enable the City of Hillsboro to alert the trimming crew to go out. As of now this is a work in progress. Lloyd Purdy of GPI said that DKS's project with Metro was designed to help Metro to make sure mobility technology doesn't just work for people with bank accounts and smart phones. Metro's mobility challenge is to make transit more "equitable". Adrian Pearmine from DKS, a transportation planning and transportation engineering firm, talked about the need for granular data, and how a database for IoT (Internet of things) devices would be enable them to visualize things more quickly. He wondered how census data and voter data could be used to drive investment decisions. Eliot Rose, senior technology strategist at Metro said his turf covers 24 cities. "The places served by transit are getting really expensive. Low income and people of color are getting displaced. He said advocates for people with disabilities were not always at the table when decisions were made, so now they are hoping to pivot. "We need trustworthy data better than timely and detailed data," he said. He said that the idea of a NASA-type mission control with lots of screens might only work the people who control traffic, but not Metro. "But we're a planning agency and we're dealing with paper maps." Asking for more data left them feeling like they were drinking from a firehose. He said if he had done this over again he would have been clearer about the context they wanted to use the data for. They all agreed that it was a good thing that this realization hadn't cost them a dime. Washington Department of Transportation (WASHDOT) and other agencies have been partnering with software giant Computer Associates. Vancouver traffic engineers want to see Active Traffic Management, which is already deployed in Seattle, come to the city to handle the commute into Portland. ATM uses LED signs above freeways and allows the agency to manage traffic actively, changing speed limits, closing lanes and running buses along the shoulder. Currently signs say things such as "Travel time to 217: 17 min"
David Hoffman of Computer Associates said, "We're here with the agencies who have a lot of data and want to share it for multi modal travel. Vancouver and Portland want this, but we've done something similar already for the country of Brazil. The killer app already exists, like Google Maps and Waze. You don't need a killer app. You need to connect the disparate sources of data. What they need is secure API's (application programming interfaces) to get the data." Hoffman told the Business Tribune that in Brazil, California, they helped link government services to the people. "Healthcare, school information...it's a simple and bidirectional relationship," he said. "So often technology separates people from their governments. This is a way to draw people to governments." He says California was involved in Healthcare.gov. California's API "manages all the exchanges between the disparate states and gets data to the federal government in a way that's consumable, like personal identification, health info, financial info, and relates it back into the IRS database." His Computer Associates colleague Samir Gandhi said that in Brazil the phrase was "Government in the palm of your hands. If you saw a pothole you could take a photo and send it in. It was a combination of writing software that enables data interoperability, and legwork, going door-to-door to the agencies." The second Mobility transportation tech challenge will be held Feb. 27, 2019 at Daimler America.